The low oil price is hitting the German chemicals giant harder than previously expected, with writedowns denting 2015 operating profit by 18 pct. Investors won’t be best pleased. But BASF has a big oil and gas investment budget it can hack back before considering deeper cuts. 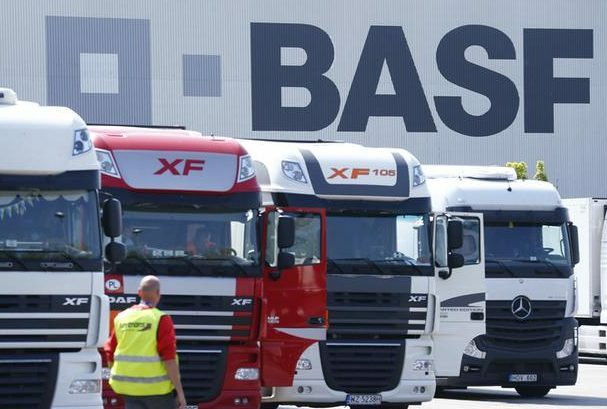 Trucks are parked in front of a warehouse of German chemical company BASF in Ludwigshafen, April 23, 2015. BASF on Jan. 27 announced a 600 million euro ($653 million) impairment charge for the fourth quarter, citing low oil prices. The chemicals group said 2015 earnings before interest and tax (EBIT) will come to 6.2 billion euros, an 18 percent drop compared to 2014. Shares in the company lost 3.3 percent to 60.07 euros by 0858 GMT. BASF’s oil and gas business Wintershall accounts for 20 percent of the group’s 2014 sales. Benchmark Brent crude oil futures have fallen to around $30 per barrel from $115 in June 2014 amid a glut in supply. BASF said it expected oil and gas prices to remain at low levels in 2016 and it had cut its assumptions for subsequent years. It said its 2015 sales fell by 5 percent to 70.4 billion euros and EBIT before special items was down 8 percent at 6.7 billion euros.